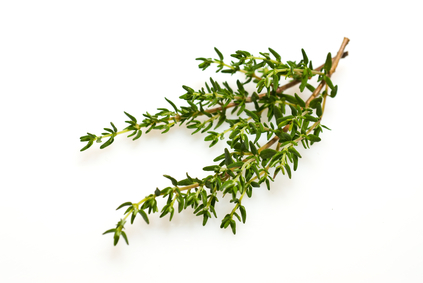 The preservative properties of thyme were discovered by the ancient Egyptians, who used it to embalm the dead. Later the Greeks burned it in temples to disseminate an aroma they believed would deliver strength and courage to soldiers. Today’s it’s on every cook’s top 10 list and remains popular as a natural remedy. Thyme has been used medicinally for thousands of years: it was recognized for its antiseptic properties long before science understood what really caused infections. It was also used as a treatment for coughs and spasms, though these uses are less common today. The plant’s most important ingredient is thymol, a compound that has a powerful ability to kill germs such as bacteria and fungi. Thymol is found in other herbs, such as basil and oregano, but no plant has higher concentrations than thyme. Thymol is a popular ingredient in antiseptic mouthwashes, and its antimicrobial abilities have also been harnessed to manage skin conditions such as acne and foot fungus. Some research suggests it may aid with other dental hygiene issues, including reducing plaque formation, gingivitis and cavities.